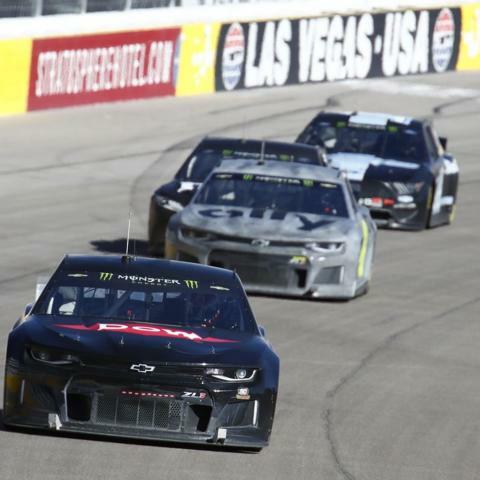 A group of 21 NASCAR drivers completed an historic organizational test with a sunny half-day session at Las Vegas Motor Speedway on Friday. In addition to single-car laps, drivers ran two more drafting sessions on the final day, racing at high speed around the 1.5-mile speedway in packs of up to 11 cars. NASCAR's two-day test session was scheduled to help drivers get accustomed to the new 2019 Monster Energy NASCAR Cup Series aero package that is designed to foster tighter racing. For 2012 Cup Series Champion Brad Keselowski, the test was a great way to get some seat time in his No. 2 Team Penske Ford. "We were pretty good, and I feel like, if we're as fast as we were today when we come back to race, I feel like we'll be a threat to win," said Keselowski, who won the first playoff race in LVMS history in September. "(The car) is about as different as it can be, but it's our job to master it and be the best with it. I feel like we learned some things and got better, and that's kind of what you expect when you have something so much different than what we're normally accustomed to, but I'm glad to see that's how it played out." Bubba Wallace, driver of the No. 43 Richard Petty Motorsports Chevrolet, was happy to get back behind the wheel after the offseason and also see how the new cars handled in and out of the draft. "It's just good to get back in the car and knock the dust off," Wallace said. "(The car) was completely different than what I expected. I expected it to be a little bit like the All-Star Race, but it had a lot more speed than that. When we got in the pack, it was a little bit of a handful, and we've still got to work on passing a little bit. "It's not quite plate racing, but (when you get out of the draft) you can hear the motor pick up a different octave and feel it in the seat. It's just the fine balance of if you want your car really fast by yourself or really fast in the pack." Seven-time NASCAR Champion Jimmie Johnson topped the speed chart on Thursday at 178.885 miles per hour, while Keselowski hit the highest speed on Friday at 178.436. Team crew chiefs and engineers gathered a plethora of data during the two-day session. "I think it was a huge learning experience for us," said Kevin Meendering, who is in his first year as Johnson's crew chief. "We got out there in a decent pack and figured out what issues we're going to have, what we need to work on and some direction of how we need to develop our cars. It's going to be a trade-off of building speed in your car versus handling, and that's going to be track dependent and is going to be a big learning curve, for sure." Having the input from a seven-time champion is a luxury Meendering does not take for granted. "It's been great, and his feedback's phenomenal," Meendering said. "He really has a great understanding and feel for the car and gives great feedback, so it really makes my job a lot easier. The communication's been great, he's easy to talk to and I feel like the learning curve has been pretty quick." 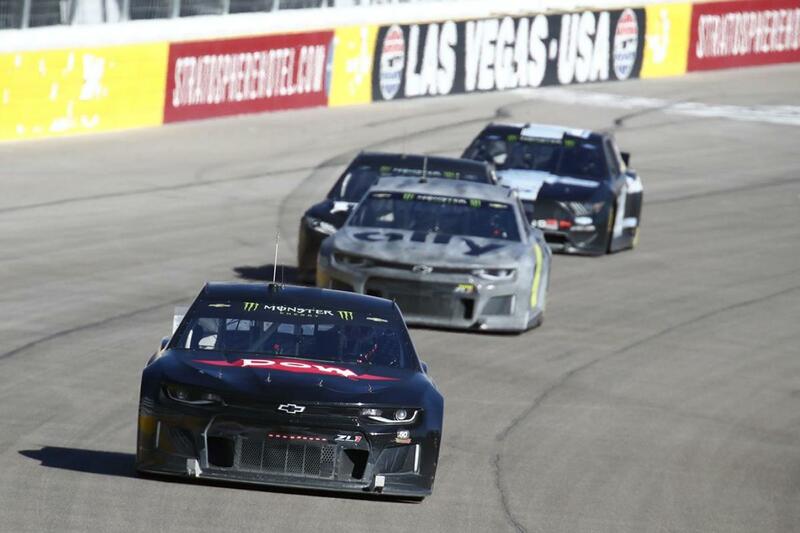 LVMS's first NASCAR tripleheader will take place March 1-3, with the Strat 200 NASCAR Gander Outdoors Truck Series race set for Friday, the Boyd Gaming 300 NASCAR Xfinity Series race following on Saturday and the Pennzoil 400 presented by Jiffy Lube anchoring the weekend on Sunday. The LVMS Dirt Track will host the World of Outlaws Feb. 27-28 and the second annual Star Nursery 100 NASCAR K&N Pro Series West race on Feb. 28, giving LVMS five consecutive days of top-notch racing. Various ticket packages, fun extras and special-access passes for LVMS's 2019 NASCAR weekends are available at www.lvms.com or by calling 1-800-644-4444.